Give: Do something nice for a friend, or a stranger. Volunteer. Join a community group. Seeing yourself, and your happiness, linked to the wider community can be incredibly rewarding and creates connections with the people around you. Lancashire County Council, supported by the Alzheimer’s Society, has launched a campaign to raise awareness about the early signs of dementia and to encourage people to visit their GP for a memory check. The campaign is aimed at friends and relatives who may have noticed changes in the memory or behaviour of someone they know, to help them spot the signs and start a conversation. There are currently over 10,000 people in Lancashire who have been diagnosed with dementia, but it is estimated that the actual number of people with the condition is much higher. These are people who may have dementia but are not aware of it and therefore are not getting support to help them live well with the condition. 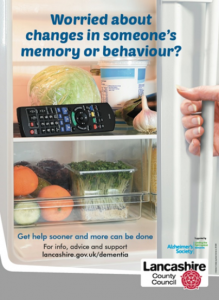 For more information, advice and support visit http://www.lancashire.gov.uk/dementia.